I was so cold when I woke up yesterday that my only goal while getting dressed was to change that as quickly as possible. It wasn't till after I had piled on a bunch of layers (including tights under my jeans) that I bothered to look in a mirror. While aesthetics were definitely an afterthought, I felt reasonably presentable to the outside world and stayed nice and toasty all day. Missy, you are doing very well on this challenge thing. I love you for trying so much. I love it - it's my style to a T! You ended up with something cold-weather appropriate AND fabulously stylish??!? Start my jealousy engines. I feel the same way about getting dressed in the morning with these freezing cold temperatures! I've been piling on the layers (well, double layers really) and hoping all those layers look fab. You look so cozy and chic! Wow. I wish I could look that put together after just grabbing something in the morning! Today's look is perfect. Causal and comfy! I think your impromptu outfit worked out perfectly! I actually really like this outfit! It's very causal yet chic. And that necklace is adorable! I just found your blog and I love your style! Today's outfit is no exception. You look great! Good luck through the rest of your 30. I think that is a great combo! You're just blessed with great instincts for these things ;). I think you pulled it off! I know what you mean about hurrying to get dressed--my house is freezing! Can it just be spring yet? i think you look fabulous! and warm, too? bonus. the necklace, for me, really ties it all together here. you're adorable. in a good way. not, like, little-kid adorable. just she-looks-friendly approachable kind of adorable. know what i mean? I think this looks great! 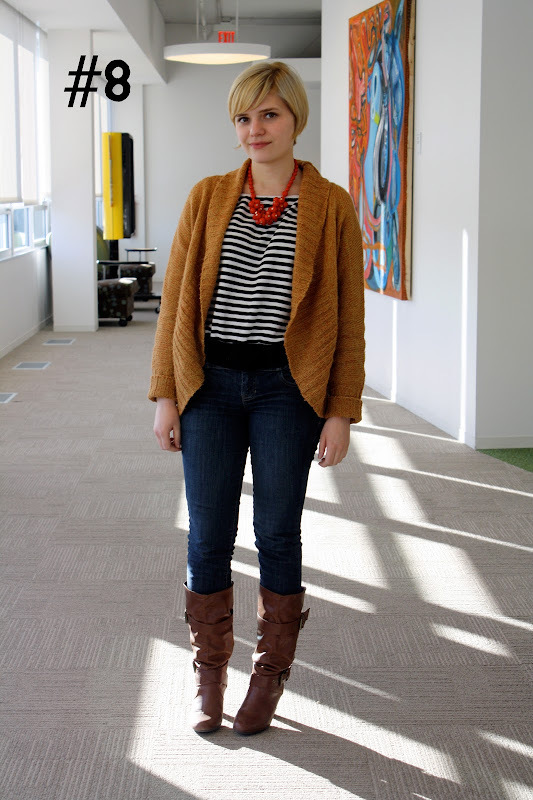 The cardigan and the necklace are great counterpoints to the striped shirt. Yea I actually love this!